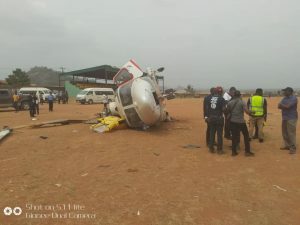 A helicopter carrying Vice-President Yemi Osinbajo and his entourage crash landed in Kabba, Kogi state at the weekend. Multiple reports said Osinbajo and all the people on board were safe. We give all the glory to God, our able protector and commend all the Flight Crew officials for their service. We are marching on for indeed we can do all things through Christ that strengthens us!”, also tweeted Laolu Akande, the media SSA. In a another statement, Akande said: Vice President Yemi Osinbajo, SAN, has arrived Kabba, Kogi State . His Chopper had crash landed after a landing incident, but everyone is safe. “Prof. Osinbajo is now in Kabba after the incident and continuing his engagements in the State, engaging the people on the Next Level plan of the Buhari administration”.